Very nice 1980:s fountain pen for calligraphy. Calligraphy and lettering Fountain Pen. These virtually maintenance free pens are ideal for comic book artists, letterers, architects, designers and engineers. »The group for everyone interested in drafting and drawing instruments, and/or related tools and materials. Two languages  German / English, 185 pages. Completely revised, second edition, offers a complete survey of the pens made by Pelikan from 1929 to 2004. A Ruling nibs for fine lines. T Ruling nibs for broad lines. 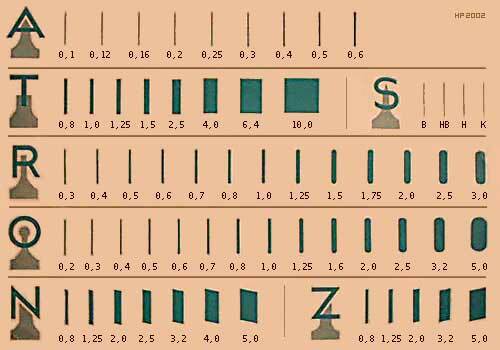 R Tubular nibs for lettering with stencils. O Round nibs for round end lines. N Right hand slant nibs for square end lines. Z Left hand slant nibs for square end lines. S Fine free-hand drawing nibs. Tubular nibs for drawing and lettering in accordance with DIN 15,16, 17. The Pelikan company was founded in 1838. The Graphos Indian ink drafting fountain pen for architects and engineers was introduced in 1934. 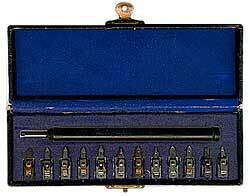 The Graphos pen was sold in sets with one holder and a number of interchangeable nibs. One of the larger sets had a pen holder, sixty different nibs and three ink feeds. Pelikan was reorganized in 1978. After that the Graphos pens were made by Rotring  at that time affiliated with Pelikan. My oldest Graphos pen set has a bakelite pen holder and 12 nibs. The newest Graphos pen in my collection is the black plastic Rotring Graphos from circa 1978. Pelikan  The manufacturer's web site. Rotring International  The manufacturer's web site. Search eBay auctions for Graphos Pens, nibs and pen sets. Search for GRAPHOS at eBay! » Read the penbid.com article Pelikan Pens (and a ??) for Graphic Artists, Architects and/or Engineers by L. Michael Fultz. » Check out leadholder.com  Dennis B. Smith's online drafting pencil museum. » Send an email if you want to buy Graphos Nibs  Check the nib list first.